Today I’m thrilled to announce the newest member of BMOW’s Floppy Emu disk emulator family – the Model C. Floppy Emu is a floppy and hard disk emulator for classic Apple II, Macintosh, and Lisa computers. The new Model C introduces an eye-catching 1.3-inch 128×64 OLED display, with crisp text and amazing contrast. Fonts are more detailed, and the OLED shows eight lines of text for better context when scrolling through a long list of filenames. The new display is a real treat for the eyes. The extra resolution of the OLED helps a lot. Text characters are 5×7, compared to 3×6 characters on the previous generation LCD. This provides a nice improvement in legibility. The Model C also features a new push-pull style micro-SD card holder, for improved durability. Some past customers lobbied for the change to a push-pull vs push-push style, and after some experimentation I decided that I agreed. This is the same style of SD card holder found in most mobile phones today, and if you’re the sort of person who’s constantly inserting and removing the SD card then you’ll appreciate this change. With the introduction of the Model C, Floppy Emu is also moving to a gloss piano black color scheme. It won’t impact the disk emulation, but it sure looks good. 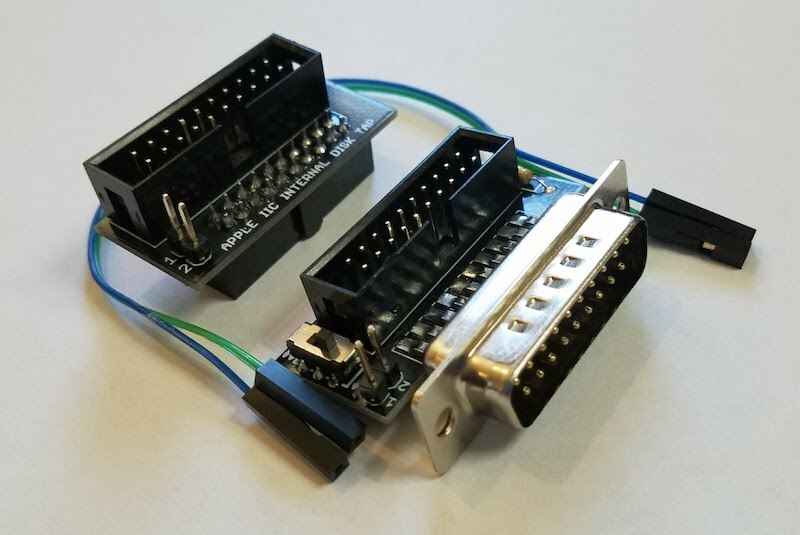 The same great disk emulation features from earlier models are also supported in the Model C. It’s directly compatible with the entire Apple II line, emulating 5 1/4 inch disks, 3 1/2 inch disks, or Smartport hard disks all without the need for a separate adapter. Of course classic Macintosh and Lisa disk emulation is supported too. Model C reads and writes emulated 140K, 400K, 800K, or 1.4MB floppy disk images, or hard disk images up to 2GB, if supported by your Apple computer. 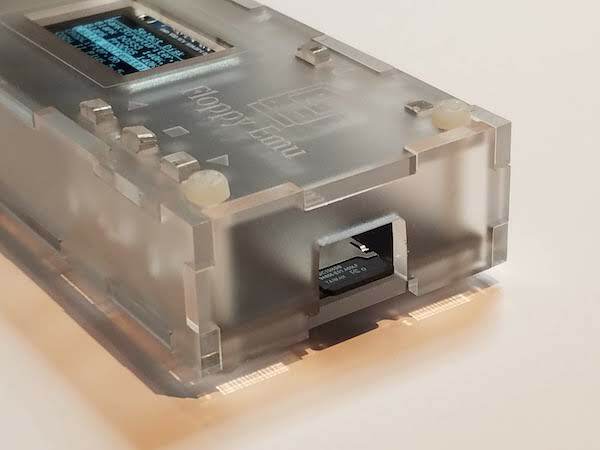 A new board requires a new case, so today I’m also announcing the Frosted Ice Acrylic Case for Model C. The cut-out surrounding the SD card has been enlarged, to make it easier to remove from the push-pull card holder. The opening in the top has also been repositioned and resized to fit the OLED, and there’s a subtle engraving surrounding it. The new case is designed specifically for the Model C. If you need a case for the older Model A or B, I’ve still got that too. All of this new hardware is available now on the Floppy Emu product page, or directly from the BMOW Store. Thank you for supporting retro computer designs! Good news, Apple II fans – support for .WOZ disk images is now available on the BMOW Floppy Emu disk emulator! The .WOZ disk image format is an exciting newcomer to the vintage computing world. 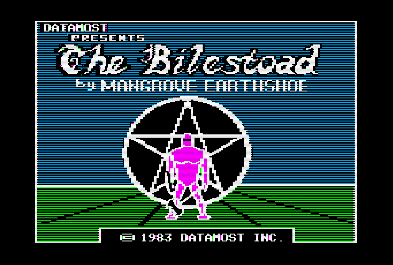 First released in 2018, it was developed by John K. Morris with the goal of being the most accurate possible representation of data encoded on an Apple II floppy disk. Other disk image formats omit certain “unimportant” data like sector headers, or make other simplifications and assumptions about the disk data. These assumptions are fine for standard software, but they fail for vintage copy-protected software that intentionally violates the standards. Some formats like NIB come closer to capturing all the low-level details of the floppy data, but still fall short. With the WOZ format, it’s possible for the first time to run heavily copy-protected vintage Apple II software directly from a disk emulator, without the need to “crack” the protection. This includes software using copy-protection techniques like cross-track synchronization, intentional invalid or blank regions of the disk, and even the dreaded Spiradisc spiral data tracks. WOZ format caught my attention when it was first announced last year, and I read through the documentation, but concluded it would be too time-consuming and difficult to add to the Floppy Emu. I was skeptical that some of the timing requirements for cross-track synchronization and other WOZ featues could be met without pre-loading the entire disk image into RAM. The Emu hardware doesn’t have enough RAM to pre-load a full disk image, so the idea looked like a non-starter, and I shelved it. But after a steady trickle of inquiries I finally took a second look at WOZ a couple of weeks ago, and was able to make it work. I was right about the time-consuming part, but wrong about the rest – I eventually found solutions to the technical challenges that worked on the existing hardware. The result is worth it. Many thanks to John for answering my questions and providing sample disk images for testing. About Floppy Emu: Floppy Emu is an external disk emulator for classic Apple II, Macintosh, and Lisa computers. 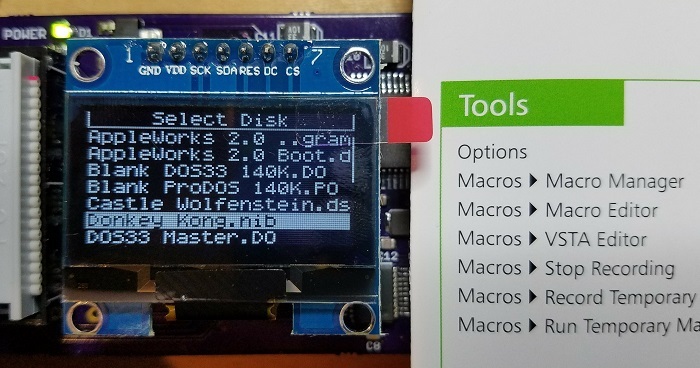 Using disk images stored on an SD card, it can emulate 5.25 and 3.5 inch floppy disks, Smartport hard disks, Unidisks, and HD20-type hard disks. 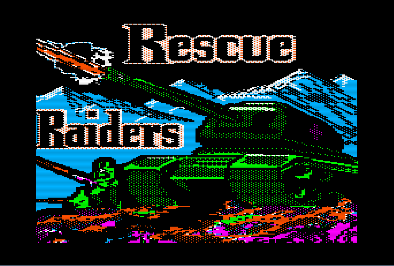 Non-standard data (example: Rescue Raiders) – Normal Apple II floppy disks have 16 sectors per track, 256 bytes per sector, with a standardized sector header beginning with the famous D5 AA 96 byte sequence. Copy-protected disks throw all the standards out the window. To avoid any possible confusion, WOZ stores each track as a single very long bit sequence, without making any assumptions about what the bits mean, or how many bits there are. The track can even have fractional bytes, with a bitsteam size that’s not a multiple of eight. 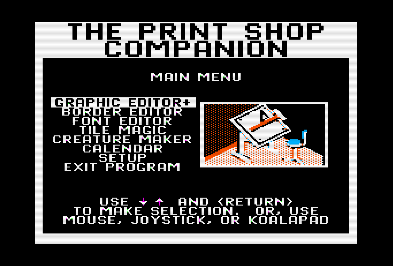 Fake random bits (example: Print Shop Companion) – Normal floppies have data on every track. Even if there’s unused space on the disk, valid sectors will still be present – they’ll just be marked as unused. Copy-protected disks may have tracks that are truly blank, with no magnetic flux transitions. A true blank track is different than an empty/unused track. 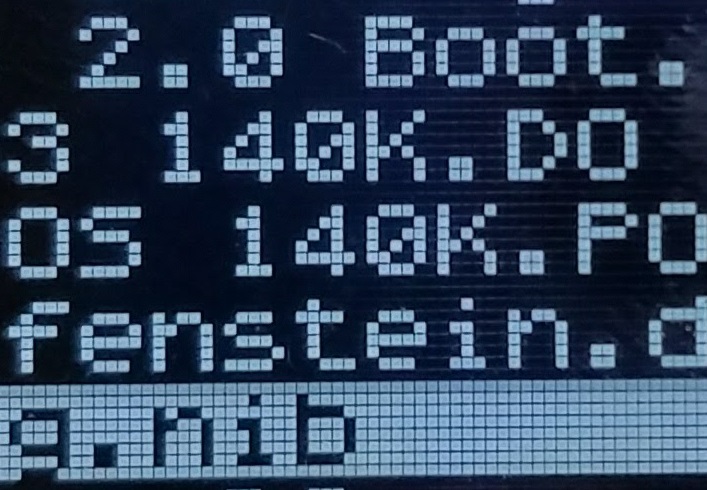 The drive hardware goes slightly haywire when attempting to read blank tracks, turning up its auto-gain control until it begins to see flux transitions that aren’t really there. The result is that reading a blank track will return a random sequence of bits that’s different each time it’s read. Copy-protected software can check for this. Because there’s no way to write a truly blank track on a standard Apple II floppy drive, this is an effective method of copy-protection. A related protection technique is to include disk bytes with three or more consecutive zero bits. These can’t be read reliably by Apple II floppy drives, and they appear as random bits, similar to blank tracks. Copy-protected games can read the same bytes multiple times, to verify that random bits appear where they should. The WOZ format solves both problems by specifically marking tracks and bits that should be treated as random, rather than as standard zero bits. 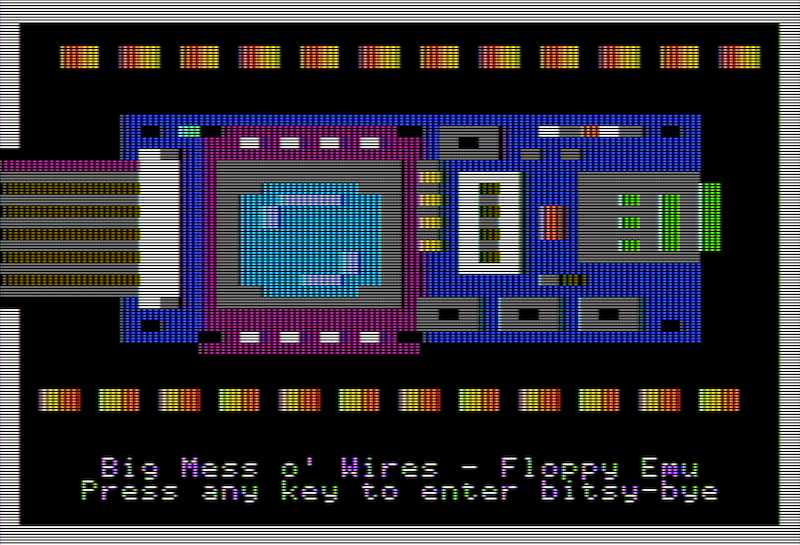 The Floppy Emu firmware can then use a pseudo-random number sequence to generate such bits when needed. Synchronized tracks (examples: Take 1, Archon, Frogger) – On a normal floppy disk, each track is a narrow ring of bits on the magnetic media, and the ring can be rotated at any angle relative to its neighbors without affecting the software. But some copy-protected disks rely on a specific rotational synchronization between neighboring tracks. For example they may require that sector 0 of the first track is physically adjacent to sector 0 of the next track. Because Apple II disk drives ignore the disk’s index hole, this track-to-track rotational synchronization is impossible to achieve when writing disks on a standard drive, and requires special mastering disk hardware. “Take 1” is a good example of software that relies on this type of cross-track synchronization. WOZ format stores each track’s bitstream relative to the same reference angle. That preserves the cross-track synchronization information. But it’s up to the Floppy Emu to maintain a consistent rotational angular velocity for the emulated spinning floppy disk while stepping between tracks or performing other operations that temporarily interrupt the bitstream. This was the most difficult part of getting WOZ working on the Floppy Emu hardware. 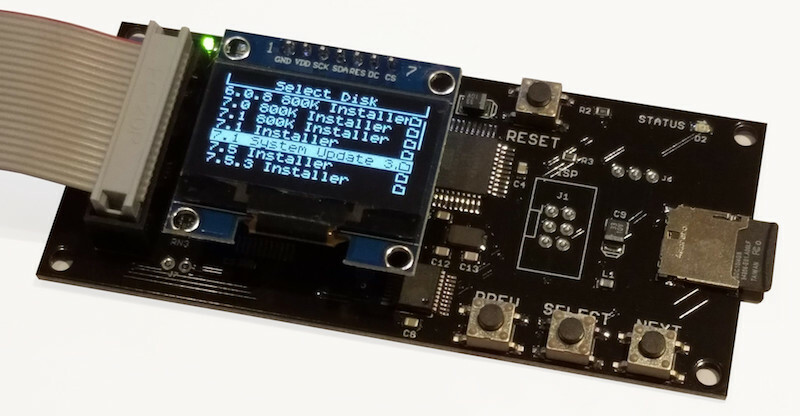 It required maintaining microsecond-level timing information about the current state of the bitstream, even while servicing hardware interrupts, reading data from the SD card, or updating the display. Some copy-protected games take cross-track synchronization even further. They include a double-wide track that spans the width of two normal tracks. The software starts reading from the first track, and then steps to the next track while reading. Reading and stepping at the same time – that’s just evil. “Archon” is one example of this double-wide synced track protection method. The ultimate in synchronized track copy protection for Apple II is Spiradisc, as found in “Frogger”. The data begins on track 0, but after less than a full disk rotation, the data jumps to track 0.25 and immediately continues. From there it follows the same pattern, with a short data section on each quarter track before jumping to the next track, spiraling all the way through the disk. Once I got Spiradisc working on the Floppy Emu hardware, I knew things were looking good. 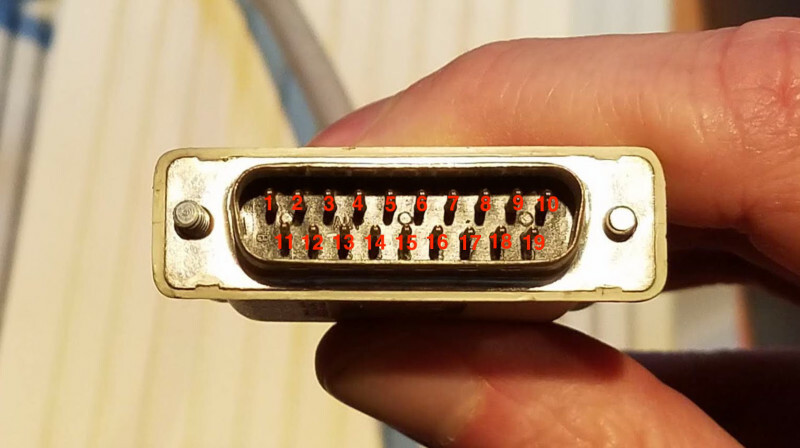 And more – Other copy-protection tricks that are addressed by the WOZ format include monkeying with the soft switches, resetting the latch midway through a byte, and storing data on quarter and half tracks (The Bilestoad). It’s a jungle out there! 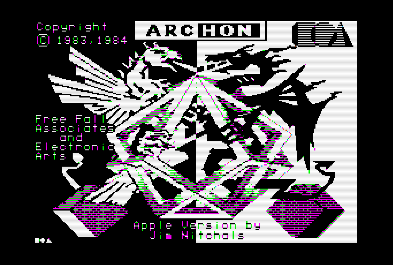 There’s an incredible variety of copy-protection schemes used by vintage Apple II software. Even with the addition of WOZ support to the Floppy Emu, you may still encounter some protected software that doesn’t work correctly. 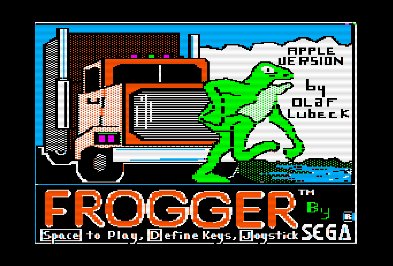 Some games such as Frogger apparently work only when using a real Disk II controller card, and the built-in disk port of an Apple IIc or IIgs won’t work. A few protected titles may work intermittently or not at all, for reasons that aren’t clear. If a game doesn’t boot on the first attempt, give it a second try. Typically the protection check happens only once during booting, and then you’re good to go. Looking for a discount on a Floppy Emu Deluxe Bundle, and want to spread some holiday cheer at the same time? BMOW is running a holiday promotion called Get 10 Give 10. Use the coupon code GET10GIVE10 during checkout, you’ll save $10 off a Floppy Emu Deluxe Bundle, and I’ll donate a further $10 to Samaritan House of San Mateo. It’s a chance to save money on retro computer hardware and do something good for the world too. Floppy Emu is a floppy and hard disk emulator for classic Apple II, Macintosh, and Lisa computers. It uses an SD memory card and custom hardware to mimic an Apple floppy disk or hard disk drive. It’s perfect for booting your favorite games, transferring files from vintage to modern machines, and troubleshooting a computer without a working OS. The deluxe bundle includes the Floppy Emu, an acrylic case, and an SD card with a collection of vintage Apple software disk images. Full details are available here. 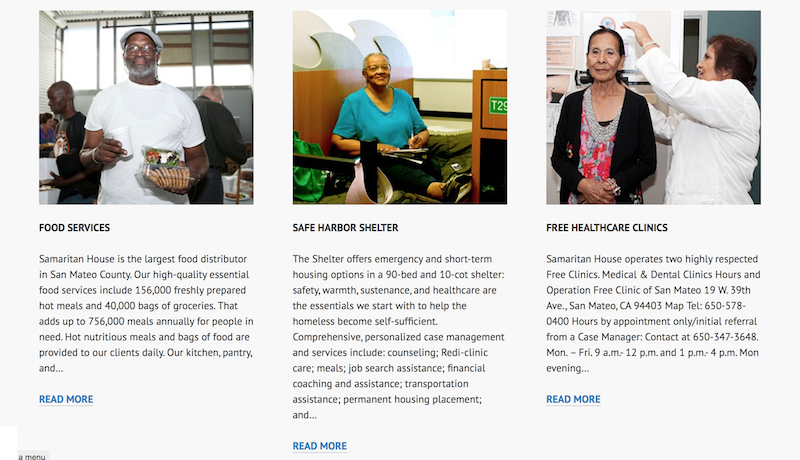 Samaritan House provides food, shelter, healthcare, housing, financial assistance, and more to low-income and homeless persons in the San Francisco Bay Area. 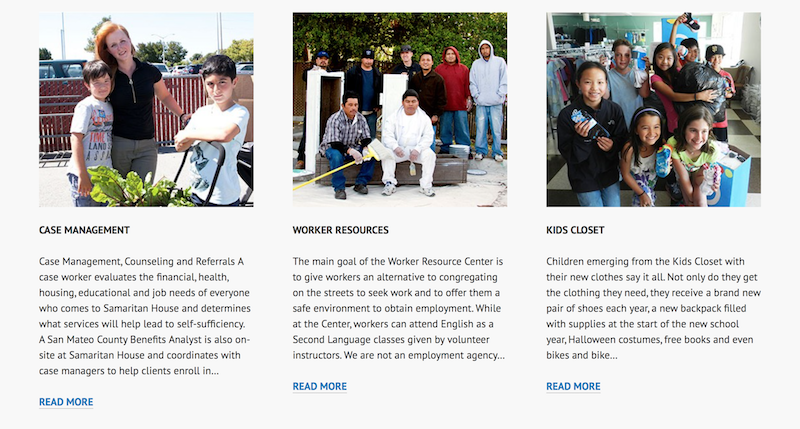 Even in the midst of Silicon Valley’s affluence, there are many people struggling just to meet the basic needs of daily life. A small boost at the right time can help them regain self-sufficiency. Samaritan House operates a broad variety of free services and one-on-one assistance with caring staff. I’ve seen first-hand what they can do, and it’s amazing. If you’ve had your eye on a new Floppy Emu, or need a second or third unit for your growing computer collection, here’s your opportunity. Thank you for supporting the good work of Samaritan House! Enter the coupon code GET10GIVE10 during checkout to take advantage of this offer.